In my previous articles i explained Wpf Architecture Overview, Asp.Net Validation Controls Overview and Various examples regarding Asp.Net. 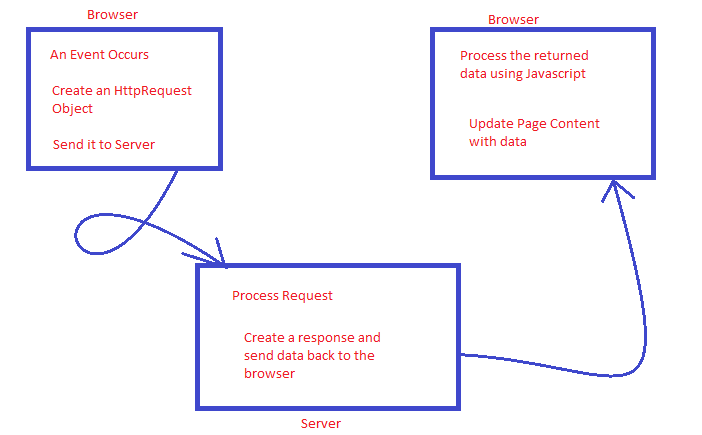 Now i will give you Overview for Asp.Net Ajax,how asp.net ajax works and Which standards will use in Ajax approach. Ajax is not a new programing language neither a technology nor a product but it is an approach to use existing standards. It is art of exchanging data with the server and allow the webpage to update it's parts allowing partial page postbacks. (without submitting the whole page to server). Thus Ajax allows the partial page rendering on the page. Using Ajax you can develop faster,better,dynamic and more responsive webpages. XmlHttpRequest Object (to exchange data asynchronously with the server). XML (format for transferring data to server). Google Maps,Gmail,Live.Com,Youtube and Facebook tabs. Ajax is very much popular by Google (Google suggest). We can use these Ajax features not only in Asp.Net but also in php,Java,asp etc. Asp.Net ajax is part of asp.net which enables in ajax features in asp.net applications. Previously it was called as "Atlas" is an extension Asp.Net Framework 2.0. This extension is developed to support both client side and server side. Networking layer is main in ajax extension client profile which is responsible or manages the asynchronous calls over the XmlHttpRequest. Asp.Net Ajax includes a library of client script functions which gives more advantages of object oriented programming and asp.net model to client scripting. Asp.Net Ajax also provides server-based support that includes web server controls that can automatically render client script that is required for Ajax functionality. Interactive UI Elements such as progress indicator, tooltips and pop-up windows. Improved efficiency of web forms using partial page rendering. Auto generated proxy classes that automatically calls web service methods from client script. ability to customize server controls to include client capabilities. Highly used asp.net Ajax server controls are ScriptManager, UpdatePanel, UpdateProgress and Timer.To enable the Ajax features on Asp.Net you must add ScriptManager which adds ajax features to the Web Form. Using ScriptManager and UpdatePanel ,Asp.Net ajax updates the selected parts of the page only without submitting whole page to server. Update progress Control used to provide status of progress occuring in UpdatePanel. I hope you got an idea about Asp.Net Ajax Extension Functionality and How it works. In my next i will explain about Asp.Net ajax server Controls and How to create First Asp.Net Ajax enabled Application. Your valuable suggestions, Comments are always welcome.